To install or remove a roof carrier, you can use the mounting bracket and cover on the roof. When you install a roof carrier, do the following procedure. 1. 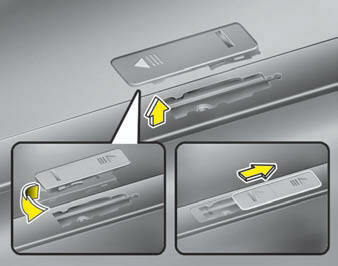 Insert a slim tool (coin or flat blade driver) into the slot and slide the cover toward the arrow on the cover. Use a coin or flat blade driver when you remove the roof carrier cover. If you use your fingernail, it may injure your finger. 2. Rotate the cover half way and insert the cover on the roof hole as the illustration. To prevent losing the roof carrier cover, install the cover on the roof before you install the roof carrier. 3. After using the roof carrier, install the cover back on the roof in the reverse order. 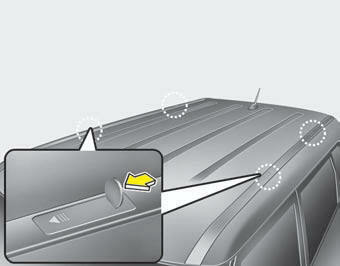 If the vehicle is equipped with a sunroof, be sure not to position cargo onto the roof in such a way that it could interfere with sunroof operation. When carrying cargo on the roof, take the necessary precautions to make sure the cargo does not damage the roof of the vehicle. When carrying large objects on the roof, make sure they do not exceed the overall roof length or width. The vehicle center of gravity will be higher when items are loaded onto the roof.Avoid sudden starts, braking, sharp turns, abrupt maneuvers or high speeds that may result in loss of vehicle control or rollover resulting in an accident. Always drive slowly and turn corners carefully when carrying items on the roof. Severe wind updrafts, caused by passing vehicles or natural causes, can cause sudden upward pressure on items loaded on the roof. This is especially true when carrying large, flat items such as wood panels or mattresses. This could cause the items to fall off the roof and cause damage to your vehicle or others around you. To prevent damage or loss of cargo while driving, check frequently before or while driving to make sure the items on the roof are securely fastened.